Sagittal T1-weighted precontrast and postcontrast MRI. A surgically proven, solitary right parietal metastasis is seen with a single, 1-cm, enhancing right parietal nodule and extensive surrounding edema typical of a metastasis. Brain metastases are an increasingly important cause of morbidity and mortality in cancer patients. Thus, brain metastasis presents a therapeutic challenge for the treating physician and is an emotionally and physically debilitating event for the patient. Early diagnosis and aggressive treatment of brain metastasis may result in remission of brain symptoms and may enhance the quality of the patient's life and prolong survival. Most patients with a known primary tumor undergo imaging studies when neurologic signs and symptoms develop. Magnetic resonance imaging (MRI) with contrast enhancement currently is the procedure of choice, because MRI is more sensitive and specific than other imaging modalities in determining the presence, location, and number of metastases. However, contrast-enhanced computed tomography (CT) scanning is used widely because of its accessibility and low cost. [4, 5, 6, 7, 8] In situations where MR imaging is not possible, contrast-enhanced CT can be helpful in detecting areas of neurovascular unit disruption and defining the contrast-enhancing tumor burden for large areas of disease. With regard to screening for intracranial metastases, no consensus has been reached concerning when to use CT or MRI for initial staging evaluation of a patient with cancer. However, brain MRI for patients with primary cancers that frequently metastasize to the brain (eg, bronchogenic carcinoma) is probably cost-effective. Numerous studies have shown that contrast-enhanced MRI detects 2-3 times as many lesions as contrast-enhanced CT, especially lesions that are less than 5 mm in diameter. In addition, approximately 20% of patients with solitary metastatic lesions on CT show multiple lesions on MRI. The decision to perform imaging for patients with other cancers is made on the basis of the clinical evaluation. In the presence of multiple cerebral metastases from an unknown primary source, a limited search for the primary tumor is of value; such a search includes a chest radiograph, breast examination and mammography, and abdominal ultrasound (US). An extensive search for an occult malignancy is unrewarding. Surgery may be required for patients presenting with a solitary intracranial tumor or to search for a possible primary tumor. Approximately one third of patients operated on for a single cerebral metastasis diagnosed with contrast-enhanced CT probably have more than one lesion. Contrast-enhanced MRI is more sensitive than CT in detecting the number of cerebral metastases. Skull radiographs may detect multiple lytic or sclerotic deposits when the metastatic process involves the cranium. Lung and breast tumors are the most common primary malignancies to affect the skull. Multiple lytic lesions secondary to multiple myeloma tend to be uniformly small. Blastic metastases are seen in patients with primary prostate cancer or in patients who have undergone treatment for breast cancer. Calcifications are uncommon in metastases but do occur in primary adenocarcinoma, osteogenic sarcoma, and lung and breast carcinoma. Plain radiographs are not helpful in detecting metastatic disease of the brain. Multiple lytic or blastic lesions are highly suggestive of a metastatic process. Solitary lesions must be differentiated from other pathologic processes affecting the skull vault. Normal anatomic variants, such as emissary vein, arachnoid granulation, and bone island, may mimic a metastatic lesion in a known cancer patient. Use of CT with bone windows may eliminate false diagnoses. Contrast-enhanced CT demonstrates multiple enhancing metastatic nodules at the gray-white junction in a patient with known colon cancer. On noncontrast CT, the density of metastatic lesions may be less than, equal to, or greater than that of adjacent brain parenchyma. Most of the patterns are variable and are nondiagnostic, as shown in the images below. Precontrast- and postcontrast-enhanced CT demonstrates multiple ring-enhancing lesions (thick, peripheral, ringlike) in the left hemisphere with prominent surrounding edema and mass effect in a patient with known lung cancer. Noncontrast CT of a patient with lung cancer. 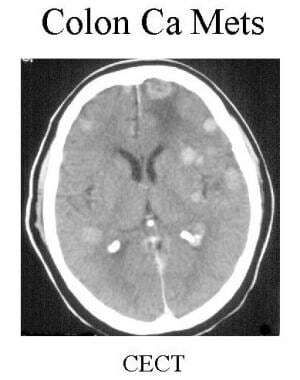 Multiple high-density lesions are seen in both cerebral hemispheres, suggestive of hemorrhagic metastases. Noncontrast CT is performed to detect hemorrhage into metastases. 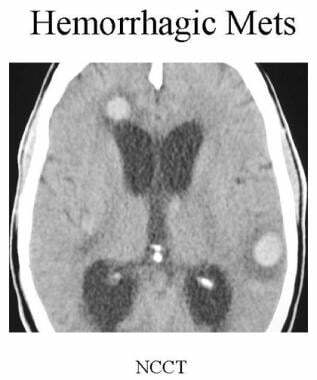 Hyperdensity in a metastasis is more likely to be hemorrhage than calcification (see the image below). Precontrast- and postcontrast-enhanced CT scan of a patient with mucin-secreting adenocarcinoma of the stomach. Multiple calcified nodules are seen in the surgically proven metastasis. IV administration of contrast material (30-40 g iodine) increases the diagnostic accuracy of CT. Most metastases enhance after a standard dose of IV contrast. Use of a higher dose of contrast (80-85 g of iodine) and delaying scanning by 1-3 hours after injection of the contrast agent lead to a further increase in the detection of multiple metastases; such an approach is appropriate if MRI is not available. The detection of additional metastases has important diagnostic and therapeutic implications. In cases in which there is no known primary cancer, if a solitary lesion is found on routine enhanced CT, the presence of an additional lesion may suggest a metastatic process, provided the solitary lesion is believed to be a primary lesion. In cases involving a solitary metastatic lesion of the brain, detection of an additional lesion may have a bearing on treatment; with multiple lesions, surgical treatment may be forgone in favor of chemotherapy, radiation therapy, or both. Contrast-enhanced CT is effective in detecting major leptomeningeal spread. Contrast-enhancing subdural or epidural metastases may be seen, usually secondary to calvarial lesions. Of breast, lung, prostate, and renal-cell neoplasms, 5% metastasize to the calvarium; of these, 15% extend into the subdural space. See the images below for contrast-enhanced CTs. Precontrast- and postcontrast-enhanced CT of a patient with breast cancer. Linear enhancement in the anterior falx and medial sulci of both frontal lobes suggests leptomeningeal and dural carcinomatosis. Contrast-enhanced CT and bone CT of a patient with breast cancer. 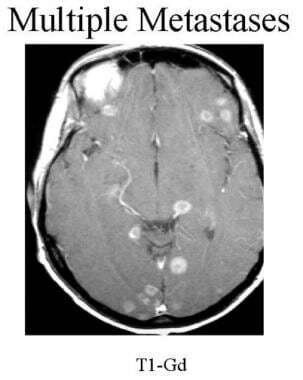 Multiple irregular and aggressive lytic lesions are seen in the calvarium with dural-based metastases. 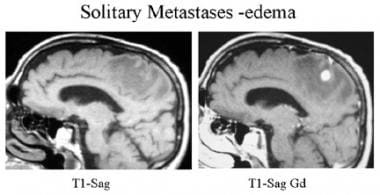 On findings of multiple, enhancing solid lesions at the gray matter–white matter junction and prominent surrounding edema in a patient with known primary cancer, a diagnosis of metastases may be confidently made. Approximately 90% of patients with a history of cancer who present with a single supratentorial lesion have brain metastases. Patients with multiple lesions are even more likely to have metastatic disease. Before undergoing definitive therapy, patients who are found to have a single metastasis on contrast-enhanced CT should undergo a contrast-enhanced MRI examination, if facilities for such an examination are available. 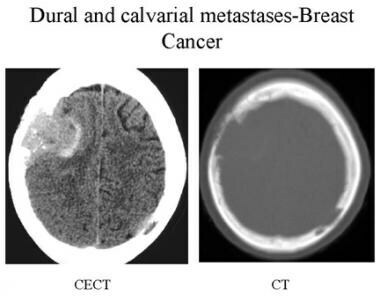 Routine cranial CT is useful in the staging of cancer in the patient with non–small-cell lung cancer; cranial CT has a sensitivity of 92%, a specificity of 99%, and an accuracy of 98% in detecting brain metastases. 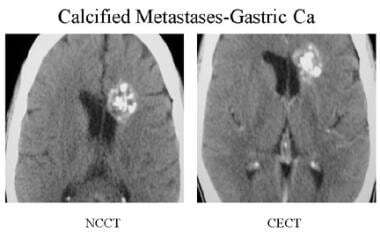 Contrast-enhanced CT is perhaps the best method to identify calvarial metastases. In studies comparing contrast-enhanced CT with contrast-enhanced MRI, approximately 20% of patients who demonstrated a single lesion on CT demonstrated multiple lesions on MRI. Mostly, the lesions missed on contrast-enhanced CT were smaller (<2 cm in diameter) and were located next to the bone in a frontotemporal location. Dural-based metastases may mimic meningioma. Coronal contrast-enhanced T1-weighted MRI. Multiple solid and cystic supratentorial and infratentorial mass lesions are seen in a patient with known breast cancer. Note the cystic, ring-enhancing, and solid patterns. Axial contrast-enhanced T1-weighted MRI of a patient with known lung cancer. Multiple, small ring-enhancing lesions are seen in both hemispheres. Lesions are isointense to mildly hypointense on T1-weighted images; they are hyperintense on T2-weighted images or with fluid attenuation inversion recovery. Surrounding edema is relatively hypointense on fluid attenuation inversion recovery and on T1-weighted images; they are hyperintense on T2-weighted images. Hemorrhagic metastases or melanoma lesions are hyperintense on T1-weighted images. On T2-weighted images, mucinous adenocarcinoma may be hypointense because of calcification; hemorrhagic metastases may be hypointense because of the chronic breakdown of blood products. Following administration of a contrast agent, solid, nodular (see first image below), or irregular ring patterns of enhancement are seen. Nonenhancing lesions (see second image below) are less likely to be metastases. 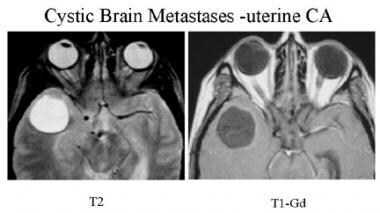 T2-weighted and postcontrast T1-weighted MRI of a patient with uterine cancer. Well-defined, nonenhancing, round lesion with fluid signal intensity is seen in the right temporal lobe, with prominent surrounding edema. This is a surgically proven cystic metastasis. Contrast-enhanced MRI is the best method for detection of meningeal tumor seeding, which appears as abnormal dural enhancement. This is a nonspecific finding; however, in the correct clinical setting, it correlates with the presence of sheets of tumor cells affecting the meninges. Gadolinium-based contrast agents have been linked to the development of nephrogenic systemic fibrosis (NSF) or nephrogenic fibrosing dermopathy (NFD). NSF/NFD has occurred in patients with moderate to end-stage renal disease after being given a gadolinium-based contrast agent to enhance MRI or MRA scans. NSF/NFD is a debilitating and sometimes fatal disease. Characteristics include red or dark patches on the skin; burning, itching, swelling, hardening, and tightening of the skin; yellow spots on the whites of the eyes; joint stiffness with trouble moving or straightening the arms, hands, legs, or feet; pain deep in the hip bones or ribs; and muscle weakness. Use of magnetization transfer with single-dose gadolinium administration is roughly equivalent to triple-dose, postcontrast, spin-echo imaging in detecting lesions and lesion conspicuity. It has been shown that treatment with dexamethasone leads to a reduction in evidence on MRI of peritumoral edema and, occasionally, a lessening in the extent of contrast enhancement. If a lesion is found and a definitive diagnosis cannot be established, biopsy should be performed. High-dose gadoteridol (ProHance) is better able to detect additional smaller lesions than routine-dose gadopentetate dimeglumine (Magnevist). Detection of additional lesions is important when considering surgical treatment of a solitary lesion. Magnetization transfer used with routine-dose gadolinium contrast is closely comparable to the high-dose technique. 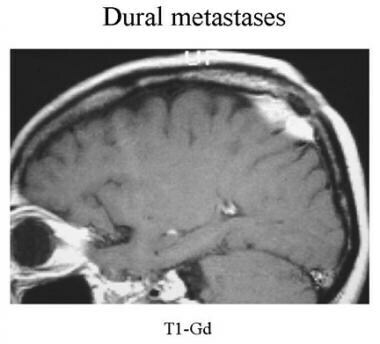 On imaging, dural-based metastases (see first image below) may resemble meningioma. 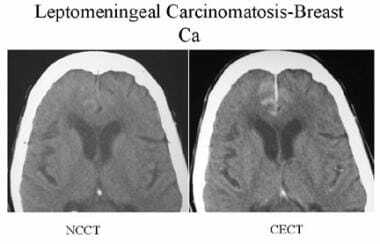 Leptomeningeal carcinomatosis (see second image below) may resemble chronic meningitis; however, an appropriate history or detection of primary cancer may be sufficient for establishing the diagnosis. Leptomeningeal enhancement may occur after the administration of radiation or following extra-axial hemorrhage; it may also occur below a craniotomy site. Single or multiple ring-enhancing lesions with edema may resemble infectious processes. Solitary lesions resemble primary brain tumors. Sagittal contrast-enhanced MRI of a patient with known prostate cancer. The solitary enhancing right parietal extra-axial lesion is a surgically proven dural metastasis. Coronal contrast-enhanced MRI of a patient with known melanoma. 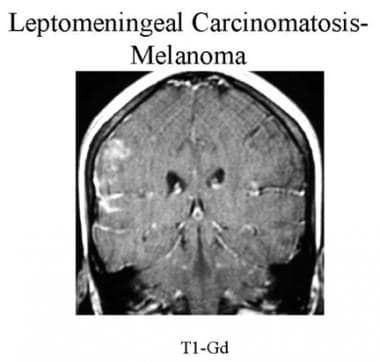 Note the linear enhancement in the sulci and brain surface of the right frontal and temporal lobes suggestive of leptomeningeal carcinomatosis. The cancer was proven by cerebrospinal fluid cytology. Radionuclide studies are sensitive but are highly nonspecific. In studies involving a small number of patients, FDG-PET demonstrated low sensitivity and low specificity. Currently, FDG-PET is not considered superior to CT or MRI in the initial evaluation of suspected brain metastases. Angiography currently is not used as a primary diagnostic procedure for metastatic disease. Rarely, preoperative angiography and embolization of large hypervascular metastases from renal and thyroid cancer may be useful. Angiography is useful in evaluating tumor vascularity in selected mesastatic lesions before biopsy is performed. The results of angiography are nonspecific in the diagnosis of metastases. Barajas RF Jr, Cha S. Metastasis in Adult Brain Tumors. Neuroimaging Clin N Am. 2016 Nov. 26 (4):601-620. [Medline]. [Full Text]. Yamamoto M, Serizawa T, Higuchi Y, Sato Y, Kawagishi J, Yamanaka K, et al. A Multi-institutional Prospective Observational Study of Stereotactic Radiosurgery for Patients With Multiple Brain Metastases (JLGK0901 Study Update): Irradiation-related Complications and Long-term Maintenance of Mini-Mental State Examination Scores. Int J Radiat Oncol Biol Phys. 2017 Sep 1. 99 (1):31-40. [Medline]. Sunwoo L, Kim YJ, Choi SH, Kim KG, Kang JH, Kang Y, et al. Computer-aided detection of brain metastasis on 3D MR imaging: Observer performance study. PLoS One. 2017. 12 (6):e0178265. [Medline]. [Full Text]. Sze G, Milano E, Johnson C. Detection of brain metastases: comparison of contrast-enhanced MR with unenhanced MR and enhanced CT. AJNR Am J Neuroradiol. 1990 Jul-Aug. 11(4):785-91. [Medline]. Barajas RF Jr, Cha S. Imaging diagnosis of brain metastasis. Prog Neurol Surg. 2012. 25:55-73. [Medline]. Ozawa Y, Omae M, Fujii M, Matsui T, Kato M, Sagisaka S, et al. Management of brain metastasis with magnetic resonance imaging and stereotactic irradiation attenuated benefits of prophylactic cranial irradiation in patients with limited-stage small cell lung cancer. BMC Cancer. 2015 Aug 15. 15:589. [Medline]. Bauer AH, Erly W, Moser FG, Maya M, Nael K. Differentiation of solitary brain metastasis from glioblastoma multiforme: a predictive multiparametric approach using combined MR diffusion and perfusion. Neuroradiology. 2015 Jul. 57 (7):697-703. [Medline]. Yeh RH, Yu JC, Chu CH, Ho CL, Kao HW, Liao GS, et al. 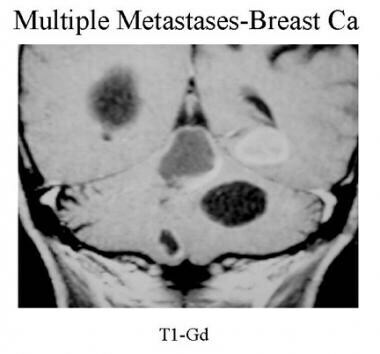 Distinct MR Imaging Features of Triple-Negative Breast Cancer with Brain Metastasis. J Neuroimaging. 2015 May-Jun. 25 (3):474-81. [Medline]. Ferrigno D, Buccheri G. Cranial computed tomography as a part of the initial staging procedures for patients with non-small-cell lung cancer. Chest. 1994 Oct. 106(4):1025-9. [Medline]. 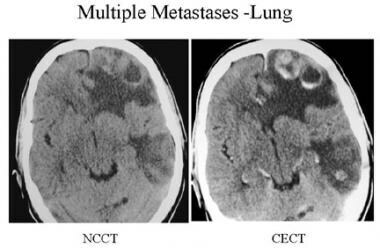 Hardy J, Smith I, Cherryman G. The value of computed tomographic (CT) scan surveillance in the detection and management of brain metastases in patients with small cell lung cancer. Br J Cancer. 1990 Oct. 62(4):684-6. [Medline]. Akeson P, Larsson EM, Kristoffersen DT. Brain metastases--comparison of gadodiamide injection-enhanced MR imaging at standard and high dose, contrast-enhanced CT and non-contrast-enhanced MR imaging. Acta Radiol. 1995 May. 36(3):300-6. [Medline]. Andersen C, Astrup J, Gyldensted C. Quantitative MR analysis of glucocorticoid effects on peritumoral edema associated with intracranial meningiomas and metastases. J Comput Assist Tomogr. 1994 Jul-Aug. 18(4):509-18. [Medline]. Hochstenbag MM, Twijnstra A, Wilmink JT. Asymptomatic brain metastases (BM) in small cell lung cancer (SCLC): MR- imaging is useful at initial diagnosis. J Neurooncol. 2000 Jul. 48(3):243-8. [Medline]. Knauth M, Forsting M, Hartmann M. MR enhancement of brain lesions: increased contrast dose compared with magnetization transfer. AJNR Am J Neuroradiol. 1996 Nov-Dec. 17(10):1853-9. [Medline]. Kuhn MJ, Hammer GM, Swenson LC. MRI evaluation of "solitary" brain metastases with triple-dose gadoteridol: comparison with contrast-enhanced CT and conventional-dose gadopentetate dimeglumine MRI studies in the same patients. Comput Med Imaging Graph. 1994 Sep-Oct. 18(5):391-9. [Medline]. Schellinger PD, Meinck HM, Thron A. Diagnostic accuracy of MRI compared to CCT in patients with brain metastases. J Neurooncol. 1999. 44(3):275-81. [Medline]. Sparacia G, Gadde JA, Iaia A, Sparacia B, Midiri M. Usefulness of quantitative peritumoural perfusion and proton spectroscopic magnetic resonance imaging evaluation in differentiating brain gliomas from solitary brain metastases. Neuroradiol J. 2016 Jun. 29 (3):160-7. [Medline]. [Full Text]. Hanssens P, Karlsson B, Yeo TT, Chou N, Beute G. Detection of brain micrometastases by high-resolution stereotactic magnetic resonance imaging and its impact on the timing of and risk for distant recurrences. J Neurosurg. 2011 Sep. 115(3):499-504. [Medline]. Ginsberg LE, Lang FF. Neuroradiologic screening for brain metastases--can quadruple dose gadolinium be far behind?. AJNR Am J Neuroradiol. 1998 May. 19(5):829-30. [Medline]. Griffeth LK, Rich KM, Dehdashti F. Brain metastases from non-central nervous system tumors: evaluation with PET. Radiology. 1993 Jan. 186(1):37-44. [Medline]. Tang BN, Van Simaeys G, Devriendt D, Sadeghi N, Dewitte O, Massager N, et al. Three-dimensional Gaussian model to define brain metastasis limits on (11)C-methionine PET. Radiother Oncol. 2008 Sep 1. [Medline]. Kitajima K, Nakamoto Y, Okizuka H, Onishi Y, Senda M, Suganuma N, et al. Accuracy of whole-body FDG-PET/CT for detecting brain metastases from non-central nervous system tumors. Ann Nucl Med. 2008 Aug. 22(7):595-602. [Medline]. Nakamura H, Taguchi M, Kitamura H, Nishikawa J. Fluorodeoxyglucose positron emission tomography integrated with computed tomography to determine resectability of primary lung cancer. Gen Thorac Cardiovasc Surg. 2008 Aug. 56(8):404-9. [Medline]. Chakraborty PS, Kumar R, Tripathi M, Das CJ, Bal C. Detection of brain metastasis with 68Ga-labeled PSMA ligand PET/CT: a novel radiotracer for imaging of prostate carcinoma. Clin Nucl Med. 2015 Apr. 40 (4):328-9. [Medline]. Nandu H, Berkowitz F, Esposito G. False-Positive Finding of Brain Metastasis on 18F-FDG PET Imaging Due to Early Subacute Ischemic Stroke. Clin Nucl Med. 2013 Apr 18. [Medline]. Abdelmalik AG, Alenezi S, Muzaffar R, Osman MM. The Incremental Added Value of Including the Head in (18)F-FDG PET/CT Imaging for Cancer Patients. Front Oncol. 2013. 3:71. [Medline]. [Full Text]. Lizarraga KJ, Allen-Auerbach M, Czernin J, DeSalles AA, Yong WH, Phelps ME, et al. (18)F-FDOPA PET for differentiating recurrent or progressive brain metastatic tumors from late or delayed radiation injury after radiation treatment. J Nucl Med. 2014 Jan. 55 (1):30-6. [Medline]. [Full Text].